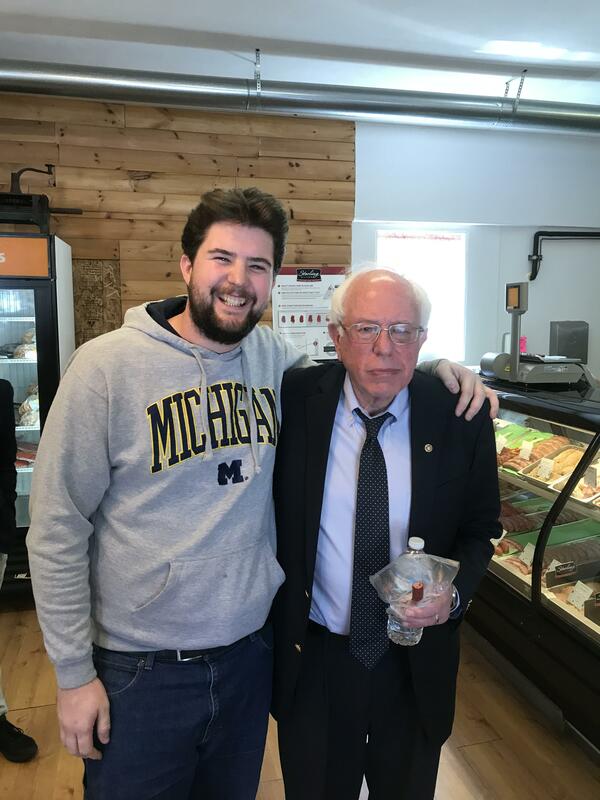 So I Met Bernie in the middle of no where Michigan. I donated $1.00 to Bernie Sanders 2020 campaign because Deborah from Brownstown Charter Township in Michigan was the millionth person to add her name and join our fight. Match me x 1,000,000! Any other Bernie supporters here from Michigan? If you live in Kansas, Michigan, Missouri, or Washington than today is your primary election. Get out there and vote; take your friends, family, coworkers and neighbors. Recommendations for progressive candidates in the primaries in Kansas, Michigan, Missouri and Washington. Plus a bonus special election in Ohio. All taking place Tuesday August 7th. The primary elections take place Tuesday August 7th in Kansas, Michigan, Missouri and Washington. In addition, there is a special election in Ohio on the same day in Congressional District 12. Here are BKAS-recommended progressive candidates in those states. In general, these candidates are Berniecrats, with positions similar to Bernie. But not every candidate supports every position Bernie has, so check their linked webpage to be sure about supporting them. You may need to scroll down to find your state. Finally, scroll down all the way to the comments on this post, because sometimes people leave comments about other good progressives running in downballot races. Note that Kansas has primaries that are open to unaffiliated voters, which means that if you are registered with a party, you will need to vote in their primary. But if you are not registered with any party, you can choose which primary to vote in. Jack Bergeson is the most progressive candidate and supports Medicare-for-All, but he is only 17 years old and will be in his senior year in high school. I’m not sure how many voters are willing to elect a high school student to be Governor. The next most progressive option is probably Arden Andersen. There is no US Senate race in Kansas this year. KS-01: There is only one Democrat running, Alan LaPolice, but his website is quite vague making it difficult to know if he supports progressive policies like Medicare-for-All. KS-02: There is only one Democrat running, Paul Davis. Davis is a moderate Democrat and does not mention healthcare, college tuition, raising the minimum wage, etc. on his website. There is only one Democratic candidate, Brian “BAM” McClendon, but his website is not very inspiring in terms of ensuring integrity of the vote. Republicans Dennis Taylor and Craig McCullach both seem to have stronger platforms on protecting the integrity of the vote. Taylor proposes “auditing elections, backing up votes with paper ballots in all counties, and constantly verifying systems security.” McCullach says “Although Kansas has some of the strongest election laws in the country, we must ensure county election officials have access to the most modern and secure election equipment available. Increased auditing frequency and capabilities and election observation is crucial to maintaining citizen confidence in our democratic processes”. Also, here are Ballotpedia links for the State-level races. I haven’t had time to research these candidates, so you’ll have to do your own research on them. There is no state senate election in Kansas this year. The next one will be in 2020. In State House District 4, George Hanna is endorsed by Our Revolution. Note that Michigan has open primaries so you can choose which party’s primary you want to vote in when you get to the polling place. Abdul El-Sayed (Justice Democrat Candidate and endorsed by Our Revolution, Bernie Sanders and Alexandria Ocasio-Cortez) or Jennifer Kurland (Green Party Candidate). Write-in Democratic candidate William “Bill” Cobbs has a reasonable platform too, but doesn’t mention Medicare-for-All. MI-01: The incumbent Republican is unopposed except for a write-in Democratic candidate, Matthew “Matt” Morgan. Morgan failed to qualify for the ballot because of a technical issue about his address. However, he is running as a write-in candidate. Morgan supports Medicare-for-All and other progressive positions. Here is how you can write him in and get a progressive challenger to Jack Bergman for the Fall election. MI-03: There are two Democratic candidates Cathy Albro and Fred Wooden. Neither of them directly states support for Medicare-for-All, though both kind of dance around that idea on their websites and talk about needing to cover everyone. You can read their platforms and see who you want to support. I think Albro might be more progressive overall. MI-04: There are two Democratic candidates Ziggy Kozicki and Jerry Hilliard. Both suggest that we should move towards Medicare-for-All. Their other platform positions are a bit sketchy, but Kozicki also says that he supports a living wage. MI-09: Andy Levin or Ellen Lipton or Andrea Kirby (Working Class Party). Note that there is also a Green Party candidate, John McDermott, but website does not really talk at all about the issues and I don’t think he’s a viable candidate. I would not recommend voting for him. MI-10: I think Mike McCarthy is probably the most progressive Democratic candidate choice. Here is an article about him. There is also a Green Party candidate, Harley Mikkelson, who supports Medicare-for-All and other progressive positions. MI-12: Incumbent Debbie Dingell supports Medicare-for-All and was one of the founders of the Medicare-for-All Caucus in Congress. Another option is Niles Niemuth running on the Socialist Equality Party line, though his website has no details on his policy positions. Gary Walkowitz is also running on the Working Class Party line. MI-13: This race is a bit confusing, since John Conyers resigned. There will be a special election to fill the seat until the end of Conyers term (January 2019) and a separate race to elect a new Congressman who will start in 2019 and continue until January 2021. Slightly different candidates are running in these two elections. For the Special election to fill the seat until January 2019, the progressive choices are Rashida Tlaib (Justice Democrat Candidate and endorsed by Our Revolution) or Brenda Jones. Bill Wild also says he supports Medicare-for-All, but I don’t feel his platform is as strong as Tlaib or Jones. For the regular election to fill the seat from January 2019 to January 2021, the same three candidates are running (Tlaib, Jones and Wild), but there is also a Green Party candidate, Etta Wilcoxon (I couldn’t find a website for her), and a Working Class Party candidate, Sam Johnson. MI-14: The incumbent Brenda Lawrence is quite progressive and an original co-sponsor of Medicare-for-All (HR 676). There are no other progressives in this race. In Michigan, political parties nominate candidates for some offices at their conventions instead of holding a primary. Candidates for lieutenant governor, secretary of state, attorney general, Supreme Court, and the boards of Michigan State University, Wayne State University, the University of Michigan and the state Board of Education are nominated by political parties. The Democratic Party state convention and the Republican Party state convention will both be held from August 25 to August 26. Note, these are some very important positions in the state. For instance, the Secretary of State controls voting in the state, the attorney general controls which corporations will be sued if they break laws, state boards of education control the standards for teaching, etc. So, it is important that progressives have a voice in this process. However, I think the delegates to these conventions have already been selected (if I’m wrong about that, someone in Michigan let me know). If so, your only option to sway the choice of the candidates is to find out which delegate is representing your part of the state and ask them to vote for progressive choices. Note that Washington has top two primaries where all candidates of whichever party are listed on a common ballot and the top two vote getters in each race, regardless of party, advance to the general election. That means we need to get some progressives into the top two or else they will not make it into the general election. August 7th is the last day to return your ballot. There is no Governor’s race in Washington this year. There are a lot of candidates running. The incumbent Maria Cantwell is moderately progressive, but does not support Medicare-for-All. Candidates who are more progressive and support Medicare-for-All include Jennifer Gigi Ferguson and Clint Tannehill. Socialist candidate Steve Hoffman would probably support a Medicare-for-All type program, but his website is vague about healthcare. WA-01: The incumbent Suzan DelBene is quite conservative for a Democrat and does not support Medicare-for-All. The only real option is Adam Pilskog, who is something of a Libertarian and a bit on the fiscally conservative side. However, he says “The insurance companies are where the cost-savings live, and by targeting them for reform and instituting a fair, simplified single-payer system, every American will have the care they need.” That sounds like he may support a single-payer healthcare plan. Pilskog also supports criminal justice reform, decriminalizing drugs, abolishing the death penalty, fighting climate change and campaign finance reform. WA-02: Stonewall Bird (Green Party candidate) or Collin Carlson or possibly Gary Franco, though his website is vague and it is hard to know exactly where he stands on the issues. WA-04: There is only one candidate (other than the incumbent Dan Newhouse). That candidate, Christine Brown, talks about Medicare-for-All, but in a slightly confusing manner. I think she may be open to it or maybe to a watered-down version of Medicare-for-All. But her position is an improvement on Dan Newhouse, who voted to repeal Obamacare, without any replacement plan in place. WA-05: Lisa Brown is the only Democrat running and the other candidates seem very conservative. Brown does not say she supports Medicare-for-All, but indicates she supports “affordable and comprehensive universal health care”. WA-08: Jason Rittereiser says on his website that he’s the only candidate in the race supporting Medicare-for-All. But several other candidates suggest they are for universal, single-payer healthcare now or moving towards it in steps, including Kim Schrier, Tom Cramer, Shannon Hader and possibly Keith Arnold. Check out their webpages and see which one you want to support. There is also a special election for Ohio Congressional District 12. This is the seat formerly held by Pat Tiberi, who resigned from Congress to lead the Ohio Business Roundtable. There is a Republican candidate Troy Balderson, who is quite conservative has been endorsed by Trump. On the Democratic side, the candidate is Danny O'Connor, who is quite conservative for a Democrat and has specifically stated that he is opposed to Medicare-for-All or tuition-free college – link. Don't feel comfortable voting for O'Connor? I probably wouldn't either. But you have a choice, because Green Party Candidate Joe Manchik is also running. Manchik supports Medicare-for-All, free college tuition, urgently fighting climate change and getting off fossil fuels, getting out of wars, fighting government corruption, etc. Below are candidates from our BKAS series that have progressive values. In general, the list contains candidates who have Bernie-like positions – Medicare-for-All, increased minimum wage, getting money out of politics, free college tuition, etc. However, not every candidate may support every position Bernie has. If you don’t know the candidate, check out their linked webpage. If you are not comfortable voting for any of these candidates, you can find others running in these races listed on the Green Papers or Ballotpedia for US Senate, Ballotpedia for US House or Ballotpedia for Governor. Also, here are the links to the BKAS posts on Michigan – Michigan 1 and Michigan 2, but note that they were written way back in mid-October of 2017 and candidates have changed since then. Check the Green Papers or Ballotpedia links above for the most up-to-date list of candidates in your district. The list below includes all the up-to-date candidates that have declared. MI-01: The incumbent Republican is unopposed except for a write-in Democratic candidate, Matthew “Matt” Morgan. Morgan had failed to get enough valid signatures to get on the ballot, but is running as a write-in candidate. Morgan supports Medicare-for-All and other progressive positions. Here is how you can write him in and get a progressive challenger to Jack Bergman for the Fall election.